In a blow to open government, the state Supreme Court ruled today that communications between Republican legislators and their counsel — hired to evaluate proposed redistricting plans and paid with state funds — need not be disclosed in the case challenging those 2011 redistricting plans. The court’s decision comes more than six months after the court heard the appeal on an expedited basis and then ruled in late December that Justice Paul Newby – whose re-election campaign benefited from more than a million dollars in contributions from organizations with an interest in seeing the redistricting plans sustained, particularly the Republican State Leadership Committee – need not recuse himself from the case. Newby did not recuse himself, instead voting with the 5-1 majority to reverse the lower court. Justice Barbara Jackson wrote the opinion for the court, in which Justice Robin Hudson dissented and Justice Cheri Beasley, who joined the Court in January, did not participate. Several individuals and the North Carolina State Conference of Branches of the NAACP had sued the state, legislators – including Sens. Phil Berger and Bob Rucho and Reps. Thom Tillis and David Lewis – and others in late 2011, challenging the constitutionality of the redistricting plans. In connection with that lawsuit, the plaintiffs asked to see communications between the legislators and their attorneys with the law firm Ogletree Deakins relating to the redistricting plans. Those attorneys were paid hundreds of thousands of dollars in state funds to counsel the legislators during the drafting of the plans. But the legislators objected to disclosing the communications, saying they were protected by the attorney-client privilege. Plaintiffs then argued to the lower court that the state law which makes all records relating to redistricting plans public once those plans are enacted overrode any such privilege, and the three-judge panel appointed to hear the case agreed. The Supreme Court reversed, holding that any waiver of the common law attorney- client privilege had to be expressly and unambiguously stated in the law – which it was not, Jackson said. 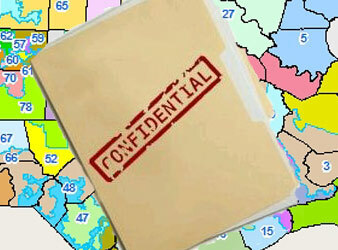 The law at issue provides that “notwithstanding any other provision of law, all drafting information requests to legislative employees and documents prepared by legislative employees for legislators concerning redistricting are no longer confidential . . . and become public records” once those plans are enacted. It also expressly includes within the definition of “legislative employees” attorneys to members and committees of the General Assembly who are paid with state funds, a provision that the majority did not address. In her dissent, Justice Hudson said that the issue of waiver of the attorney-client privilege was irrelevant, since the law clearly designated all redistricting records as “no longer confidential” once the plans were enacted. With the decision, the case returns to the redistricting panel for argument on the parties’ motions for summary judgment. A date for that argument has not yet been set. “We are disappointed with the court’s decision, but now that this preliminary matter is out of the way, we can address the merits of the constitutionality of the plans, and we believe that the evidence that will be presented to the trial court will establish that these districts are unconstitutional on several grounds,” said Edwin Speas, an attorney for the plaintiffs. Attorneys for the legislative defendants could not be reached for comment. For all you smarter than God blow heart liberals, what would have happened if the court had not upheld attorney/client privilege? “smarter than God blow heart liberals”. Just the kind of reference that opens up dialogue in a respectful manner. Now Bobby, I repeat, never a dumb question just a dumb answer. Have you read the posts by David and James? This is Sunday School stuff compared with the hatred for Art Pope by Chris, Rob and Sarah. Thank you Justice Hudson for standing up to the activist judges of the majority. Thank you ncpolicy watchers for everything you do. Frances, for future ad hominem reference the word is blowhard. To all, welcome to Art Popelina, where legislative transparency is opaque. This was a state funded lawyer. We the people are the client and have every right to read these communications. I firmly believe in attorney client privilege, however in this case you and I are the client. Wake up people. What do they have to hide? Government should not operate in the shadows. It is funny how idiots like Frances Jenkins who constantly criticize Democratic politicians have no problem with dishonesty and secrets when their “team” is in charge. All governments should be subject to scrutiny of the people who grant them the privilege to serve regardless of the party in charge. Don’t sell me short. I hate Despicable Art and his minions just as much a the next guy.